I’ve been a fan of R.E.M. for years, even blogging about my favorite album of theirs. All of their works have produced some great hits, wonderful musical moments and charming vocals and guitars. 2008’s “Accelerate” brought them back into those familiar with their classic sound. So it was with anticipation that their 15th album “Collapse Into Now” would garner some attention. The band is just a three some these days – Peter Buck, Mike Mills and Michael Stipe – but these guys who originally hailed from Athens, GA still know how to put together an album of easy liked songs. 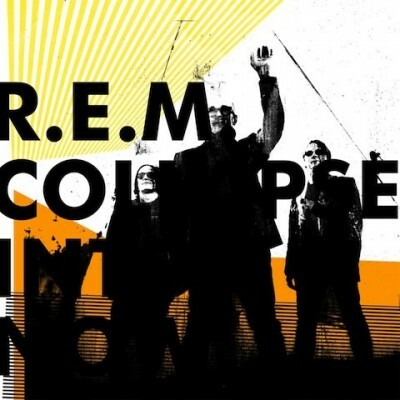 And and while I think “Collapse Into Now” is a great album, I really have to say that their previous album caught onto me much quicker. And maybe with more listens, this will catch on, too. It’s no “Out Of Time” or “Monster” which were heavy on the pop side of things, but if you are a fan, you will find this new release something of a gem. Old REM is still my favorite, but I recommend this new album to anyone that likes REM. I’ve been meaning to get back into REM. The last album I got of there’s was New Adventures In HIFI and I kind of lost track of them after that. Wow, that album was some time ago. Since then, they lost Bill Berry (the original drummer, who’s still alive) and released a good 5 albums as just an official trio. I was kind of “meh” about them for the longest time. Then I saw them on Sesame Street. Did Stipe do Sesame Street? I must have missed that episode. I finally picked this up yesterday and am looking forward to hearing it. But the singles I’ve heard so far don’t seem to quite compare to their last album. Yeah, “Accelerate” still sounds better to me, too. And that’s after a good 10-12 listens to the new album.